UPDATED: Wed., Aug. 29, 2018, 11:56 a.m.
OLYMPIA – An initiative on police use of deadly force will go on the November ballot, but not the changes the Legislature approved in an effort to make it better. 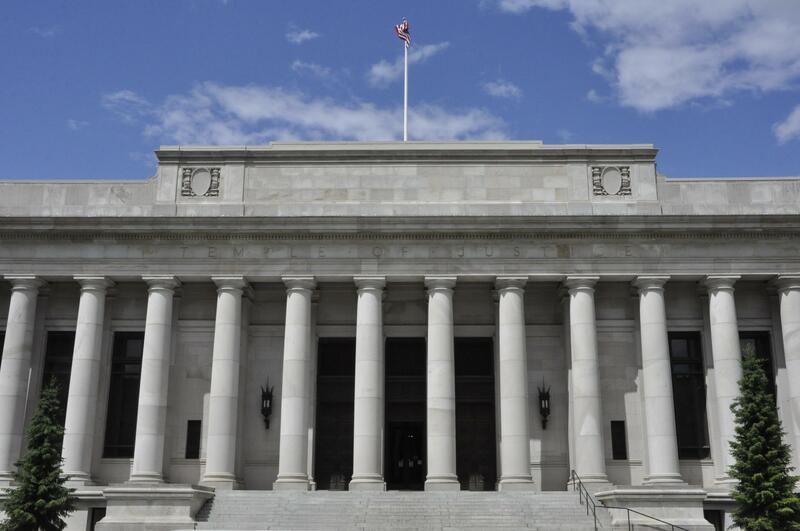 A sharply divided Washington Supreme Court, with multiple dissenting opinions covering a wide range of views on the constitutional rights of initiative, barely upheld a lower court ruling that Initiative 940 must go before voters. The Supreme Court ordered Secretary of State Kim Wyman to include I-940 on the general election ballot. But a separate bill the Legislature approved on the final day of the session, which contained changes negotiated with initiative supporters and law enforcement critics of the original proposal, will remain off. When the Legislature passed both the initiative and the separate bill with the changes, it effectively rejected I-940 and proposed a different measure on the same subject, she said. While Stephens and three other justices thought the amendments should also go on the ballot, the court could only muster a five-member majority to send I-940 to voters. The court’s decision, the second in less than a week in disputes over initiatives, clears the way for ballots and a voter’s pamphlet for the November election to be printed. I-940, sponsored by De-Escalate Washington, received enough signatures to qualify as an initiative to the Legislature. It requires that police receive violence de-escalation and mental health training, removes immunity they have in some cases and adopts a standard of an objectively reasonable response to a situation. It also requires independent investigations of police use of deadly force. Law enforcement groups objected to some of the provisions, and legislators worked with some sponsors and law enforcement representatives to draft changes. On the final day of the 2018 session, both chambers of the Legislature passed a bill with the changes and sent it to the governor for his signature. The changes were scheduled to go into law the day after the initiative would. After Gov. Jay Inslee signed that bill, the Legislature approved I-940, but not before Sen. Mike Padden, R-Spokane Valley, and other critics said that was illegal. The constitution says a Legislature can approve an initiative without changes, Padden said, but if it wants to make changes, it must approve an alternative and put both on the ballot. Critics said allowing I-940 and the bill to become law in quick succession would undermine the initiative process. Tim Eyman, who makes his living as a sponsor of initiatives, sued and was joined by Padden. The justices came down on different sides of the issue, and four separate opinions were issued. Only by wading through the different concurrences and dissents could the court reach a majority. Two justices joined Stephens in saying I-940 must go on the ballot because the Legislature hadn’t really passed the initiative without changing it. They said the court should look at the entire scope of what lawmakers did, and put the bill with the amendments on the November ballot also, to give voters a chance to vote on an alternative to I-940. Justice Mary Yu concurred with Gordon McCloud, and in a highly critical separate opinion said those who want to put both proposals on the ballot were trying to “wash our hands of it all and put everything to the voters.” The court has no authority to void a law that isn’t invalid or unconstitutional, she wrote. “While there is some appeal to these simplistic solutions, they damage our jurisprudence, undermine respect for the separation of powers and empower professional initiative peddlers selling governance by populism in place of elected representation,” Yu wrote. That left the court at four justices saying nothing should go on the ballot and four saying both I-940 and the alternative should go on the ballot. Justice Barbara Madsen cast the deciding vote: I-940 was not passed without change or amendment, as the constitution requires, she wrote, so it must go on the ballot. The separate bill was validly passed, but there’s a problem with putting it on the ballot, Madsen wrote. The bill contains a line that says if I-940 goes on the ballot, the bill is void. Giving voters a proposal that would be void would be “absurd,” she wrote. With the split decision, the lower court’s ruling stands that I-940 goes to voters and the separate amendments don’t. Published: Aug. 28, 2018, 10:30 a.m. Updated: Aug. 29, 2018, 11:56 a.m.